Provide comfort for the family of Dorothy Davenport with a meaningful gesture of sympathy. Dorothy Pearson Davenport, known to her family and friends as Dina, age 64, of Pensacola, Florida, passed away on March 13, 2019, in her home, surrounded by her family and friends. Dina was born in Fulton, Alabama, January 19, 1955, to loving parents Rial Hobson and Carrie Merle Pearson. Dina grew up in Camden, Alabama, the ninth of twelve children. She graduated from Wilcox County High School in Camden, Alabama in 1972 as Valedictorian of her class. After graduation Dina moved to Columbia, South Carolina. Dina worked in various jobs during the ten years she lived in South Carolina and only a short time after moving to Columbia she met her husband, William (Bill) Davenport. Dina moved to Orlando, Florida where she spent the next thirty-three years. Dina worked for UPS for a short time and then found her forever "dream" employment, working for Orange County Sheriff's Department. 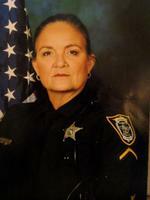 Dina retired with twenty-three years of service as a Master Deputy Sheriff. Job well done. Dina was recognized for her service during hurricane Katrina Relief Efforts by the Orange County Sheriff's Department. Dina also worked as an off duty security officer at Sea World and for church services on Sunday Mornings. Dina was a member of the Northland Church in Orlando Florida and the Point Baptist Church in Pensacola Florida. Preceded in death by her husband, William (Bill) Davenport, her mother, Carrie Merle Pearson, her father, Rial Hobson Pearson, her sister, Ann Roberts Walker. Survived by brothers, Willie G Pearson (Elaine) Bryant Pearson (Faye) James Pearson (Mary Ann) all of Camden, Alabama, Harold Pearson (Roxie) Atmore, Alabama, Coleman Pearson, Terry Joe Pearson (Wendy), Camden, Alabama, William ( Winky) Pearson (Cindy), Theodore, Alabama, sisters, Jeanette Hall, Northport, Alabama, Cynthia Hussey (Patrick), Cottondale, Alabama, Bernice Evans (Parker), Perkinston, Mississippi. A memorial service will be held in her hometown of Camden, Alabama, at a later date. Dina was an avid animal lover. She leaves behind her dog, Zoey, and her cat, Isis, who she dearly loved very much. She loved going to the movies with her friends and eating out, she loved people in general. In lieu of flowers please make a donation to your local Humane Society or the American Cancer Society in her memory. To send flowers in memory of Dorothy Pearson Davenport, please visit our Heartfelt Sympathies Store. Provide comfort for the family of Dorothy Pearson Davenport by sending flowers. The staff of the American Cancer Fund® at www.AmericanCancerFund.org is sorry to hear of Dorothy’s passing. We have received a memorial donation in her name and our sincere condolences go out to her family. Condolences to the family hope you can find comfort in the memories shared of Dorothy and the beautiful scriptures, and. Prayers shared to help you through the difficult time of losing you're loved one Trust in Jehovah God (Psalms 83:18 ) he will help you and comfort you through all you're difficult times my deepest sympathy for the family please feel free to visit jw..org to help you understand the reasons why we all grow old and die and the promise God have for the living and the ones that have fallen asleep in death a resurrection and living forever on a paradise earth.